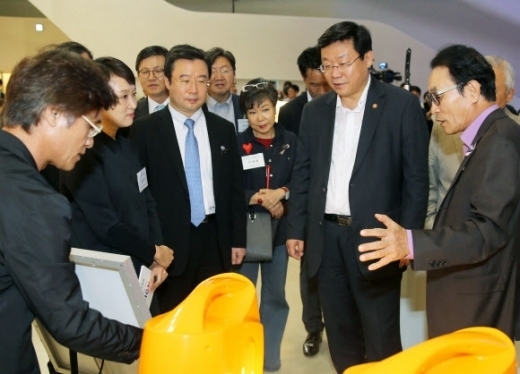 While more and more Korean companies acknowledge the importance of “design management,” small and medium-sized enterprises face difficulties in seeking it, a survey showed Tuesday. The survey was conducted to determine the level of awareness about design management ahead of the sixth Herald Design Forum slated for Nov. 8. Aside from design business, 73 percent of CEOs considered design of products and services important. About 65 percent said that design “significantly” influences sales, while half said design itself also has an impact on brand image. Despite growing awareness about design management, the introduction of design management was mostly determined by the size of the companies. According to the state-run Korea Institute of Design Promotion, the design industry amounted to about 14.4 trillion won ($12.68 billion) as of 2014, up by 10 percent on-year. At the same time, Korea’s GDP growth rate was 2.6 percent, indicating the design industry is rapidly growing. Most professional design manpower was found to have been heavily concentrated at conglomerates, however. While the average number of employees in design at conglomerates soared from 16 to 34 per company in a year, the number for SMEs actually dropped from 2.4 to 2 employees per company. “Although I know that design consideration is essential, it is difficult to make it one of the top priorities, as the employees and I tend to focus on other more important factors with our limited budget,” said a 34-year-old startup founder surnamed Jeong, who recently launched a mobile news application in Seoul. In order to narrow such a gap in the design industry, the government vowed in August to inject a total of 40 billion won by 2020. The Ministry of Industry, Trade and Energy also launched a design innovation scheme with an aim to promote design management of 100 promising SMEs upon selection. The ministry said it would also provide support for the whole process, from preliminary consulting to design research and development and marketing. It will also offer short-term research and development vouchers for companies preparing for export or new product development. The vouchers will be valid for a period of six months. To boost the sales of innovative design products, the government has decided to expand the design product-only markets from three to 10 across the country by 2020. In addition, it will support 10 promising designers every year to support their talents at international exhibitions and help them study abroad.